Gibsea 126 Master built 1986 in Marans France By Gibert Marine S.A. Hull: Solid glass hull very heavy layup with glassed in bulkheads and balsa cored deck and cabin top. Hull to deck joint, bolted and glassed. Full watertight bulkhead 10 ft back from bow that forms sail /gear stowage compartment and is accessible by large deck hatch with ladder. 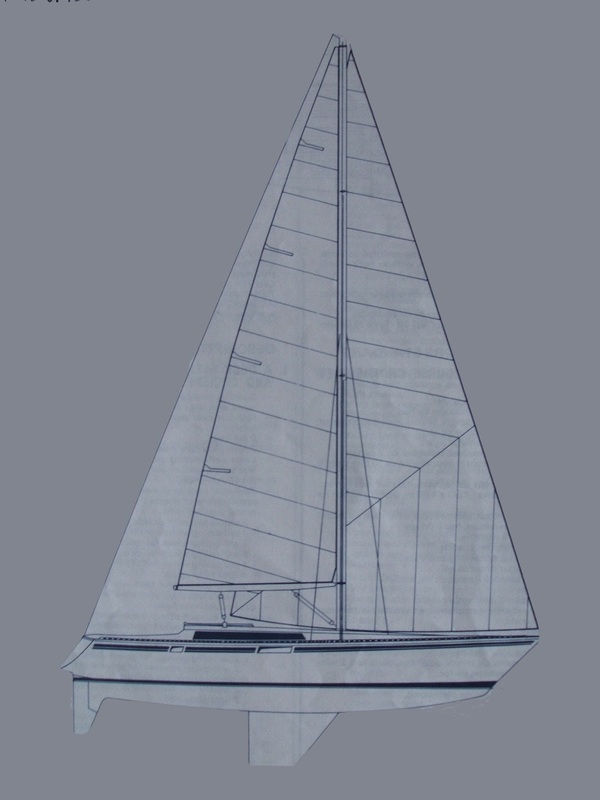 Rig: Originally twin spreader masthead sloop. Now rigged as cutter with running back stays. Mast: Aluminum sparcraft deck stepped mast, boom, and pole. Stainless steel Arch with dingy davits, solar panel, radar, wind generator, speaker and antenna mounts. Stainless stern rail integrated into arch and continues forward of hard dodger. Nova lift dinghy engine hoist with stainless and teak engine storage block. A plastic window curtain can be raised between the top of the hard dodger and the bimini during rainy periods and a mesh panel can be raised for ventilation and shade. Stern swim step made from stainless steel/teak with fold out swim ladder and steps up the transom. This provides easy access to the boat from the dingy. A hot and cold water outlet in cockpit is used for showers on swim step. Port and starboard lazeretes are large and easy accessible to climb into and house steering, autopilot, batteries, SSB antenna tuner, propane storage container, spinnaker and emergency offshore gear. 90% Shade fabric used for wind curtains. This keeps the air and most spray out but also allows you to see out easily. Extra cockpit drains were added and drain through the transom. A Plexiglas table folds up from the binnacle and has extra leaves which allows four people to eat comfortable . Outdoor galley. We have a sea swing mount on the rail near our barbeques so that we can make rice etc and NOT heat up the boat below. It is amazing how hot it can get cooking in the tropics. There is a fish cleaning station and two 6lb rain mounted aluminum propane bottles supply the BBQ’s and Sea Swing. I have the basic wind/knot and depth setup with one display in the cockpit and the wired remote down below. I also added a connection point in our cabin so that I can see the instrumentation at night (when the wind wakes me up at anchor) or I can run an extension cable to the bow so I can check the water depth while we are going through gnarly passes without us having to shout back and forth to the cockpit. Shuttle SV25 computer with remote LCD screen. I added a 12-volt supply external to the case and used the old space from the original supply to add an additional fan with oversize holes drilled in the aluminum case. An external fan was added to pull air up and out from behind the entire compartment. Both fans are controlled by an external switch, which has three settings (off, med and high). The computer comes with an onboard temperature monitor/alarm system, which I use to control the fan settings. I rarely need them since the main heat (power supply) is external to the case. I also conformal coated all the pc boards to keep the corrosion out, so far so good (I'm sure this voids the warrantee). The LCD screen is 8.5 x 11 inches and I mounted it in a aluminum picture frame. See www.earthlcd.com for details on how to buy the raw screen. I would get one with the TV input option if possible (wasn't available at the time I bought mine) that way you can use it as a display for your dvd player. I also have the LCD screen for the DVD player mounted on a homemade pole mount which allows it to rotate to the navstation or the salon area depending on it’s current use. IBM laptop.. bought refurbished at Tiger direct for $500. It is an older model but has a serial port and a slower (less power) processor. It works fine for EVERYTHING except editing video. You might have guessed that I am not a big fan of anything that is AC powered but sometimes you have to bite the . I use the simple West Marine 700 inverter (I bought two on sale for $40 each); which I hard wired instead of using the battery terminal clamps. The only instrumentation I have at the helm is the single Nexus repeater and the Autopilot control. Our friends on Apsara designed the smartest system I have seen yet; the instrument pod swivels around it’s hanging point on the binnacle. Because we have such good steering options we RARELY spend time standing at the helm, so having the instruments ONLY facing aft doesn’t make much sense!! I use the wired remote when I am sitting under the dodger but the swiveling pod would be better. Don’t put everything at the helm; I’ve seen people standing out in the rain and spray just because their instruments are there (and they have to stand on their toes just to see around the instruments). The anchoring setup has worked out VERY nicely and was quite a surprise when it's full functionality was discovered. If you look at the diagram above you'll see a bunch of sail bags behind the anchor; this is Billabong's garage, which is a watertight compartment. To this we added partial bulkhead that forms the primary chain locker (nice and low and aft). The bottom of the new locker was then glassed over with Kevlar (for both impact and chain chafe protection). The top of the partial bulkhead is covered with a trimmed piece of stainless tubing which allows me to move some of the chain further aft for the long passages. The best feature is the flexible hawse pipe, which is just a 2 inch diameter hose attached with stainless tubing bracket under the windlass and 6 inch sleeve at the bottom for chafe protection. Attached to one side of the hose is a bungee cord and to the other side is a line that goes up through a block to the deck where I use the windlass remote. This allows me to pull on the line that moves the flexible hawse pipe back and forth and automatically flakes the chain for me. If I need to move anything it's all right there; a quick jump down the ladder. I know I must look a little funny standing on the bow pulling a line up and down while raising the anchor, but I highly recommend trying this if you have the room for the lines etc. In one side of the old anchor locker I keep the backup Bruce anchor and rode ready to go at all times with a small bin to keep the chain under control. The other side holds the dingy fuel and keeps it (and its fumes) way out of the way. I always keep a short piece of line on deck attached to a chain hook. This allows me to quickly take the load off the windlass if needed. It allows me to remove the primary chain (held secure and out of the way) and feed the secondary anchor rode/chain around the windlass OR I can feed all the primary chain into the other side of the old chain locker (remove the safety lashings) and add backup rode to the primary anchor. Lofrans vertical capstan and chain gypsy electric windlass with hard wired up foot switch. 3 Sections 50 foot 3/8 Chain with 1/2 Stainless Shackles and Quick links to match the load rating of the high test chain. 1 section 3/8 high test for chain Danforth to Bruce or Delta in short scope or mud situations. At first I had some chafe problems (in VERY rough weather) because Goiot had put there nice emblem as a raised casting in their deck chocks (duuuugghhhh). I removed this with a Dremel but still had some issues because the line stretch (which is good for a snubber) continues all the way to the bow cleats. Now I have added much heavier lines from the bow cleats past the deck chocks and then I shackle in the smaller lines. I haven't had much bad weather to test this but is should keep the movement through the deck chocks and it's chafing gear to a minimum. Prior to this setup, I'd burned through thick plastic hose in an hour when waves were breaking on deck at anchor in Fakarava. Heavy stainless, twin bow roller setup with removable pins. SS deck wear plates installed. Hawse pipe and Bow locker have water proof inserts to keep the water out during passages. It’ll find its way in .. we know of a boat that got to the Marquesas and found out their windlass was submerged in water in their bow locker for the entire 22 day trip, needless to say it did NOT work when they went to anchor. Hand held depth sounder to double check the swinging area in coral bomie infested areas. Also helpful for checking pass depths in remote un-charted areas. Cabin Fans Each cabin has a 12-volt computer van to draw the air away from the bottom of the bed to another Hella fan; which is positioned near a hatch and can draw air in or flush I out. Full boat awning made from breathable shade fabric from an Arizona company (comes with 10 year fabric guarantee). Pole battens are used to keep the awning rigid in the breeze. We used the same cloth to cover our jerry cans, Kayak, fenders and even made chain bags out of it!! All hatches/ports and Hard Dodger windows are covered with 70% shade fabric mesh. This protects the ports and keeps it cooler but still allows light and visibility. It is amazing the damage the sun can do. I have them to a battery switch (for maintenance charging etc) but I never have removed them from Both. Four Siemens 75 watt solar panels (flat mounted on top of arch) I added two more 80 watt panels in Tuvalu to keep up with the refrigerator demand in the tropics (we typically use 70 Amp Hours just during the 12 hours of night). Balmar 75 amp Alternator to charge splitter and ignition noise reducer. Also have a blower fan (with ducting to the cooler section of the boat) to blow air at the back of the alternator to keep it cool. Home made towing generator. Bought an old Amatek permanent magnetic 32V tapedrive motor. Inserted a diode in the line to prevent the batteries from turning the motor. I hook up a spare towing generator prop (from Downwind Marine in San Diego) and throw it over. This roughly keeps up with the autopilot and lights during the night (3 amps). I would recommend a REAL towing generator if you are NOT a power Nazi like I am. I personally like the Aqua4Gen; which has the option of converting to a wind generator when at anchor. I use the auxiliary input for the DVD player sound and the ipod. The LCD is mounted on a homemade pivot (stainless bar stock with star board bolted to the back of the screen) that allows the screen to face the nav station or the salon (work or play mode). To power these and the computer LCD screen I bought a 50watt regulated 12-volt supply from Astrodyne. This keeps the fluctuating batteries (10-15 volt) regulated to exactly 12 volts for the sensitive electronics. The Dvd player runs off of 10.5 volts so I just added two diodes to the 12-volt line to get the correct voltage. Apple Ipod (a must for all offshore work) use itunes to organize your collection. We could easily use the 20 GB version. 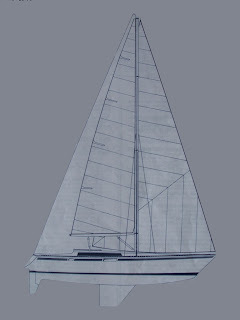 Mainsheet on track forward of dodger, All blocks new Gauhauer solid stainless. Halyards 2x headsail halyards 1 x staysail halyard 1x main halyard 1 topping lift, 1 spinnaker halyard with spinnaker pole track on mast face. I added the fourth in New Zealand after I felt over powered in 40kts on the way there on the third reef (only went to the top spreader). I converted the sail to a lose footed one so that I could easily rig webbing straps to back up all the boom block fittings and reef points. Slab reefing and outhaul has in boom line jammers. 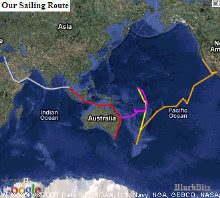 This was setup was added by Steve and is not standard Gibsea rigging .. I HIGHLY recommend it. I switch to the staysail in 30+ apparent wind. I've yet to use the storm staysail (95 sq ft) but it's ready if needed. The sock makes it very easy to fly and I like it better than an asymmetrical chute because we can go deeper down wind. Using Gauhauer blocks with cleats and lines that go to the reinforced mid-ship cleats with the tails running down each side to the cockpit. I attached both to a huge shackle that goes through the old rigid boom vang attachment (you could use webbing). I use these to control the sail shape (and boom) on all points of sail. This allows me to free both if needed and just use the standard mainsheet OR let the mainsheet run and use the preventors to control the boom. This is nice since the reefing lines all go to the base of the boom with the halyard winch on the deck so I can tweak everything from the deck without having to run back and forth to the cockpit. In fact I usually don't do much more that crack the boom off (or in) a bit and then crank in on the reef line while letting the Unless your boom is designed for it; it is hard to get all the reefing lines back to the cockpit (usually the reef cringle must be dealt with manually which requires you to be at the mast anyway). I have seen booms that have two sets of blocks, one at the end of the boom like normal and another at the front of the boom. The line runs from the cockpit up the mast to a block at the reef cringle then down to the block at the front of the boom and then back along the boom like standard reef lines. The blocks at the front of the boom allow the reef cringle to come down in conjunction with the leech reef line. Added perforated aluminum sheets over the sound proofing material to facilitate easier mounting of equipment and cleanup (I’ve seen the same stuff on the super yachts). The dingy stows between the mast and the inner forestay during passages and in the davits for day trips. On deck, we tie it down with stainless steel trucker straps around the deck rails aft, and one around the windlass forward. Starting from forward of the mast bulkhead, is the main sleeping cabin with Pullman berth to port and clothing lockers and small seat and table to starboard. Included in this area is a head and washbasin compartment. A galley pantry area has been installed in the existing head. Both wicker and plastic bins are used to store fruit and vegetables along with other galley items. A door separates this cabin from the main saloon and with the door closed there is easy room to dress or have privacy without being cramped. Three opening deck hatches supply plenty of light and air to this cabin and heads area. The galley to starboard has a fridge unit at its forward end, then bench surface with top opening compartments at the back (against the hull side) and slide out racks and trash bin on the facing side. In the middle of the galley is a 2 burner gimbaled propane stove with oven and a locker for pot stowage is beneath. Next to this is an athwart ship bench top with twin sinks and hot and cold water and a seawater foot pump spigot with a folding stainless drying rack above the sinks. Outboard of this is another insulated and fiberglass storage compartment. A locker for plates and general stowage is above this compartment. Above the sink on the starboard cabin side is an opening port, the same type of opening window is on the port cabin side. There are 2 ventilators supplying air to this area and one large hatch positioned centrally in the cabin top and 2 full-length handrails. A fan can be used to draw air into or out of the galley area. An island with book and shelved storage provides support while working in the galley underway. Aft of this central area is a navigation table and seat to port and the main head/ shower compartment to starboard. The nav area has a storage locker abeam of the seat with the hot water heater mounted below the seat. Above this is the main switch panel with both A/C and D/C breaker panels .The chart table has good legroom and a cabinet with shelves on its face side and a large stowage area aft and beneath it. The heads area is large and has an easy to use shower with an auto draining sump and an opening cabin port for cross ventilation. A Lavac head with ceramic bowl is installed. The Henderson pump has a Y-valve before the pump that allows you to empty the holding tank or the bowl and a Y-valve after which allows you to pump directly overboard or into the holding tank. The wash basin has a cabinet behind it and a stowage cabinet beneath. The varnished interior is African teak with light paneling with a teak and holly sole throughout the main cabin. Additional low power halogen lights installed in main saloon with standard stainless Red/white halogen lights accessible in all areas. Outside of the head on the fore/aft partition is a Dickinson diesel heater and day tank. Beneath the fwd saloon sole area are 2 x fresh water tanks for a total of 100 gallons. The main companionway steps are centrally located at the end of the main saloon. Behind these steps (removable) is the engine compartment with fuel filters and raw water filters immediately at hand. All panels in this area can be removed to provide really good engine access. To the port and starboard of the companion way steps and engine compartment are 2 identical sleeping cabins with double bunks, cabinets and hanging lockers and shelves Both these cabins have doors and sufficient space for privacy and changing with the doors closed Both cabins have opening ports into the cockpit and overhead opening hatches, which open within the cover of the hard dodger thus allowing them to remain open. Both cabins have hull side widows for light and view, lights, fans and electrical outlets. Within these cabins are removable panels at sole level that allow access to the motor and shaft packing. The stb cabin has a holding tank under its bunk whilst the port cabin is mostly clear storage beneath the bunk apart from the engine starting batteries positioned here. We're back home in the "real world"